Cath Avery is a huge Simon Snow fan and along with her twin sister, Wren, writes fan fiction stories online. When it comes time for the two girls to go to college, Cath’s sister tells her that she doesn’t want to be roommates. She thinks it will be better for the two of them to meet new people, but Cath disagrees. She is nervous about living with someone other than her sister, and when she meets her roommate, a seemingly angry girl with a charming boyfriend that is always around, it seems that her worst fears have come true. Cath must find a way to fit in at college, and ends up discovering a lot about herself and her sister along the way. I really loved this book! It reminded me of my junior high/high school days when my friends and I were OBSESSED with Harry Potter. I used to write and read fan fiction nearly as often as Cath does so I was able to really connect with her character. I was able to understand how she felt trying to fit in at a new place, with a roommate who seems to be completely the opposite of her. I was initially really angry at Cath’s twin sister Wren because of the way she treated her. Wren goes to college and immediately is best friends with her roommate and spends all of her free time going out drinking. She treats Cath terribly, teasing her about her Simon Snow fan fiction and acting like she is so much better than her. Cath constantly feels like the “inferior” twin because Wren has more friends and seems to have an easier time of getting along than she does. After I realized that Wren’s actions were a reaction to her mother leaving them when they were children, I was able to sympathize her more. The loss of their mother affected both girls deeply, but they have different ways of coping. Cath is very withdrawn and introverted, while Wren is very wild and extroverted. Levi was my favorite character in this story. He has such a great personality–he is constantly smiling, always happy, and just an all around friendly person and good guy. Cath’s bantering back and forth with him is so cute and funny, and I loved watching their relationship grow. He is so supportive and generally interested in Cath’s fan fiction, and that seemed to be the initial spark in their relationship. It was great to see how his support helped Cath to grow as a writer and as a person. 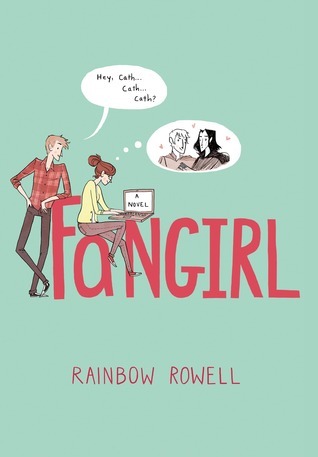 Overall, Fangirl was a fun read that reminded me of my Harry Potter obsessed days. It was a great coming of age story that I think many would enjoy! Fangirl will be released on September 10, 2013. I’ll have to put this on my TBR list, the whole book sounds great, and I like the sound of Levi’s character too! 🙂 Great review!